hollysue…who? | it's me… shushified. If you are out there lamenting that there is no good music anymore, you aren’t paying attention. 2015 was truly a banner year for great music. Which brings me to my best of the best list. GIANTS GIANTS GIANTS GIANTS. This song is easily my all-time favorite from Matt. Not to say that the rest of the album isn’t great, because it’s end to end great. It may be my 2015 desk dancing winner. also, my current favorite lyrics snippet is “We had an epic movie trailer love” from Playlists & Apologies. Matt is just so great. His curated Spotify playlist “i like music more than i like people” is a treasure nearly as good as his own music. It’s an eclectic mix – some stuff I wouldn’t ordinarily listen to, and songs that make me say ‘OMG I CAN’T BELIEVE MATT LIKES THIS SONG TOO.’ I’d love to hang out with Matt listening to music and talking books. He is my spirit animal. This is one of those albums where every time I listen to it, my favorite song changes. They’re all that good. One bit that always jumps out at me is the guitar in Speed Trap Town. So, so tasty. Speaking of tasty guitar, this is full of it. Gary Clark Jr. is a master of bluesy, soul-tinged rock guitar. This is one of those albums where i just want to put on some headphones, press play, and close my eyes and bliss out. I discovered Marc (and all his hair) when he opened for Butch a couple tours back (a tour I missed, fyi). Here we are a couple years later and he has a full length album out, produced by Butch in Nashville. This is just a fun rock and roll record, my friends, also in regular desk dancing rotation. If I were forced to pick favorites, Jericho and How Bad We Need Each Other, and When the World Breaks are probably the ones I’d pick. Today, at least. I got to see Marc open for ZZ Ward back in October, and it was a fantastic show (confession: I had only listened to a handful of ZZ Ward songs before this, and really couldn’t get into her for whatever reason, so I left not too far into her set. I saw who I wanted to see, all right?). Also, you need to check out his cover of This Land is Your Land – it was featured in a Jeep commercial that aired during the Super Bowl this year and is AHH-MAY-ZING. What can I say about this album that hasn’t already been said? Not much. It’s a brilliant adaptation. I was excited beyond words from the minute he first mentioned it on twitter and I wasn’t at all disappointed. I had literally never heard of Frank Turner before Butch Walker mentioned him (I want to say it was something about being in a cab with him in Chicago? The details are fuzzy.). Not totally my usual style, but this album is truly a winner. NO, IT’S NOT JUST BECAUSE BUTCH WALKER PRODUCED IT THOUGH I AM SURE THAT HELPED. SHUT UP. Get Better is my clear favorite; I am a sucker for an anthem, what can I say? I also saw Frank live in October. I wasn’t sure what to expect, but he has a dedicated fanbase here, and it was pretty great. This is the sooprize late addition to the list. Dropped out of the blue in November (at least, out of the blue to me), this is a super fun bunch of covers from S&R and some of their friends. Some are covers of the friends’ songs – i unsurprisingly love what they did with Butch Walker on Bullet Belt. My favorite may be how they turned Last by NiN on its head with Caroline Rose. Super great stuff. I am always a sucker for covers so this was totally up my alley. and probably some others if I kept thinking about it. Wow. It was the Year of the Dudes this year, for the most part. In reality, that’s how my music tastes tend to skew anyway, so that’s not really a surprise. I hadn’t planned to make an official goodbye post, but here I am. The are finally turning off the servers and shutting the virtual door to Friendfeed on April 9th. Friendfeed has been my online home for exactly 7 years. While I’ve used many other social networking sites before and after I started here, it has always been my constant. It started just as a place where I hung out with my librarian friends, friends who have all become a great and important part of my life. While I may have met them in other ways via the Great Librarian Interwebs, I don’t know if we’d be the friends we are today. But Friendfeed also introduced me to a whole lot of people across the country and across the world that I likely never would have found somewhere else. And for this, words really can’t express how much I am thankful for our time there. We always knew this day would come. It’s been 6 years almost since Facebook bought it and it has been our little corner of the internet, our refuge ever since. Many left after the acquisition and people dropped little by little over the years, but a core community remained. There were good times and bad. We shared so much – marriages, divorces, deaths, births, recipes, food and cat pics – the full range. Yes, there were times of drama and times I got so irritated that I had to take a timeout. But I always came back. The last month has been a time of reminiscing and reliving all those times. Now, it’s time to say the final goodbye to Friendfeed. My hope is that all these great friendships I made will remain. We may be scattering to various other sites and the interactions may change, but I am hopeful they will endure in some way. I am not always the best at reaching out and staying in touch, but I am going to try my best. I have this tattooed on my arm as a general reminder, sort of my personal motto. Some days are easier than others to follow it, but I am trying to make it my mantra for the end of Friendfeed. “Just let it go where it’s supposed to. Let your life hang out the window to dry. And if it catches the wind, and you never see it again. I’ll see you around, FF. Thank you for everything. These are a throwback from my high school cafeteria that i started re-creating a few years ago. This is a quick and dirty writeup for the inquiring minds of twitter. Heat oven to 350°. Lightly grease an 8″ square baking pan with butter or cooking spray (you can also cook in a lightly greased cast iron skillet). Roll out the dough into a rectangle (12″x18″). Brush the dough with the melted butter. Sprinkle with the shredded cheese and then the ham. 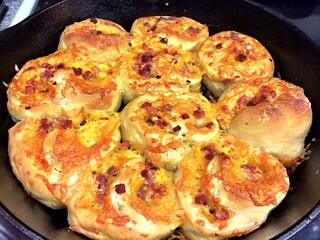 Be sure to cover the dough all the way to the edges. I usually leave a 1″ edge at the top though. Roll up from the bottom to the top, pinching to seal the top edge. Cut roll into 2″ slices. Place slices into greased pan. Sprinkle with a little additional cheese, if you feel the need (I almost always do). Bake for 25-30 minutes or until golden brown. 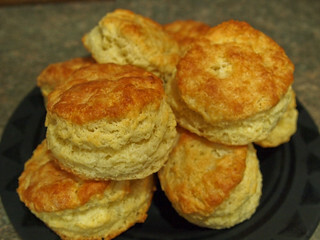 After many years of saying “I can’t make biscuits”, I recently discovered that, yes, I actually can. All the thanks go to Derrick, my favorite foodie/librarian/partner in crime. 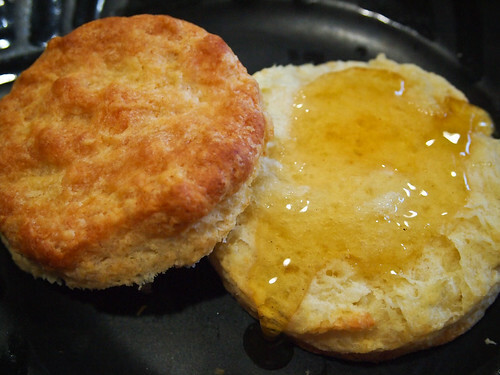 This flawless biscuit recipe comes courtesy of Derrick’s test kitchen. Preheat oven to 400F. Line a baking sheet with parchment, set aside. Mix all the dry ingredients together and then grate the frozen butter into the bowl with the dry mix. Set bowl in freezer while preparing the wet ingredients. Whisk 3/4 cup of buttermilk, egg, and 1/4 cup of yogurt, sour cream or creme fraiche together in a small bowl. Set aside remaining buttermilk. Get flour mixture from freezer and gently combine butter with the flour. Add buttermilk mixture and GENTLY mix until just combined. Lightly knead until it becomes a solid mass, and if you need to add remaining buttermilk so that the mixture isn’t dry, do so in little bits and dribbles. Dump out mass onto a floured counter and pat out into a rectangle about 3/4 of an inch thick. Fold like a letter (thirds) and pat out again. Repeat one more time (you don’t want to handle it TOO much because the dough will get tough). Be sure to flour your hands too ’cause the dough is sticky. After final pat, cut biscuits out. Push STRAIGHT down. Don’t twist. Place on baking sheet and bake for 15-18 minutes or until golden brown. Brush tops with melted butter. Makes 9-12 biscuits, depending on what size you make them. it’s been a while, but the time has come again! here is the best of the best, according to me. 5 songs and 18 minutes of pure perfection, full of emotion. Every time I think I have a favorite picked out, one of the others taps me on the shoulder and shakes its head. I always know it’s time to turn it on when I am hearing the complete songs playing in my head over and over. IT’S A SIGN. One of my favorite parts, and it has been since the first time I listened to it, is the drums from BW and drummer extraordinaire Mark Stepro on Let It Go Where It’s Supposed To is the perfect, crisp drum sound I expect from a Butch Walker production, and what it should always sound like. I had the chance to hear these live in September in ATL a week after Butch’s father passed away, and that was clearly the musical highlight of my year, and definitely in the top 5 for all-time. Super emotional show, but so, so amazing. The Marvelous 3 encore was a nice bonus too, though that meant I yet again missed hearing “Hot Girls” live. NEXT TIME, WALKER. 2013 was the year I discovered Matt Nathanson. How I had been living under a rock this long, I have no idea. In a way, I am glad though, because to me, this is clearly his best album yet, so I am starting at a good point. It is great pop/rock from start to finish, my favorite tune being Kinks Shirt. I also saw Matt live in Portland a few weeks after seeing Butch, just a short time after discovering this album, and that was a treat. His live show is definitely as good, if not better, than his recorded music, which isn’t always the case. Plus, he is funny as hell and is a total metalhead. How can I not like him?! I look forward to more great music from Matt. Let me tell you, if you had ever told me a FOB album would show up on a best-of list of mine, I’d have laughedsnorted in your face. But then Butch Walker got ahold of them and spun them into gold. I love everything about this album (well, except for the Courtney Love. meh.). My Songs Know What You Did In the Dark (Light Em Up) is what hooked me, The Phoenix is my favorite pre-run (or pre-anything) motivation song, and Save Rock and Roll. oh, Save Rock and Roll – THIS SONG. If you hear reports of someone losing their voice from singing this song so loud in the car, it’s likely me. Put that one on repeat. yeah, yeah, cementing my #ravingfangirl status by including another album with the Butch Walker touch. WHATEVS. Normally, a voice like Gin’s is a total turn-off for me, so it’s a testament to the BW touch (songs co-written and produced) that I even liked this album at all. The songs make all the difference. Black Sheep is the biggest earworm. So my new favorite hobby is making liqueurs. 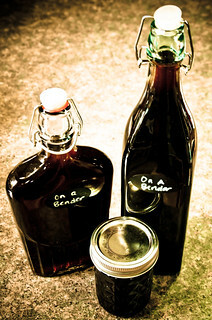 I made some awesome Bärenjäger (aka Honey Badger) last year and decided to try my hand at a coffee liqueur next. I looked at so many recipes online SO MANY, but decided to do a variation on the Serious Eat’s DIY Coffee Liqueur recipe. I used Stumptown’s Hair Bender, one of my favorite coffees, for the cold brew. I think that really helped it. The coffee taste is very smooth. Cold brew the coffee by combining the grounds and 2 1/2 cups of the water into a sealable glass jar, shaking it, then refrigerating the mixture for at least 12 hours. Strain through a coffee filter into another sealable glass jar. Combine the sugar and 2 cups of water in a pot and bring to a boil. Remove from heat and let this syrup cool to room temperature. IMPORTANT. You must let it cool. Add cooled syrup, vanilla bean, rum, and vodka to the glass jar that contains the coffee. Let that mixture steep for at least 3 days (I left mine alone for 2 1/2 weeks), then remove the vanilla bean and bottle the liqueur. So I thought I would throw together a little list of my “best of” for music for this year. If you are at all familiar with me and my music tastes, much of this shouldn’t come as a surprise. 1. Butch Walker and the Black Widows – The Spade I mean, come on. Who else would be #1? I didn’t think there was any way for Butch to top 2010’s “I Liked It Better When You Had No Heart”, but he managed to do it. There is flat-out not a bad song on this album. I thought about trying to list my favorites, but they all are, for different reasons. I honestly listen to this nearly every day. And Butch and the Widows live? unreal. They just blew me away. 2. Ryan Adams – Ashes & Fire I picked up my first Ryan Adams album (Heartbreaker) a couple years back after seeing a librarian friend mention him a bunch. I liked it but never really listened to it a whole lot. I ran across Ashes and Fire and was totally hooked from the first listen. I’ve gone back to listen to more of his past work, and I don’t know how I never picked up on him before now. It’s all a matter of timing, I think. The whole album is great, but “Lucky Now” is the standout track, in my eyes. er, ears. 3. The Decemberists – The King is Dead To me, this is just straight-up Decemberists. Another album that doesn’t have a bad song on it. Like The Spade and Ashes & Fire, this is an album I can listen to on repeat with no qualms. I really need to get around to seeing them live at some point (she says, sort of embarrassed, since she lives in PDX where they are also from.). 5. Gavin DeGraw – Sweeter I’d heard Gavin’s name mentioned here and there, but never his music. I’d heard about Sweeter because Butch produced a couple of the songs on it, so I listened to a few samples of some of the songs and was immediately hooked. I do appear to be in an indie singer-songwriter phase and this fits in there perfectly. My favorite (at least today) is probably the title track. Hook-y, soulful good stuff. This is was actually easier to come up with than i thought it would be. I spend so much time discovering new music that isn’t actually new that I had a much smaller pool to pick from. I am an obsessive scrobbler, so feel free to follow me on last.fm and see what I listen to next year. I love me some mac and cheese. 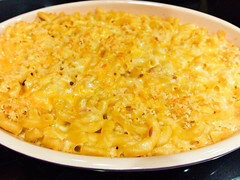 Most mac and cheese doesn’t pass muster with me, and this recipe might have something to do with that. I tweaked a few different recipes and experimented until I settled on this tasty concoction. Melt 3 T.butter in saucepan over low heat. Blend in flour and salt; cook and stir for 1 minute. Slowly add milk and then pepper, dry mustard, and hot sauce; stir constantly until thickened. Add shredded cheese (reserve 1/2 c. or so for topping) and stir until cheese is melted. Mix pasta and cheese sauce in 2 qt.casserole dish. Sprinkle remaining cheese on top. For topping: mix melted butter with bread crumbs and sprinkle on the top.